Kyrmen Shylla, Cabinet Minister addresses the concluding function of the conclave on Monday. ST photo. 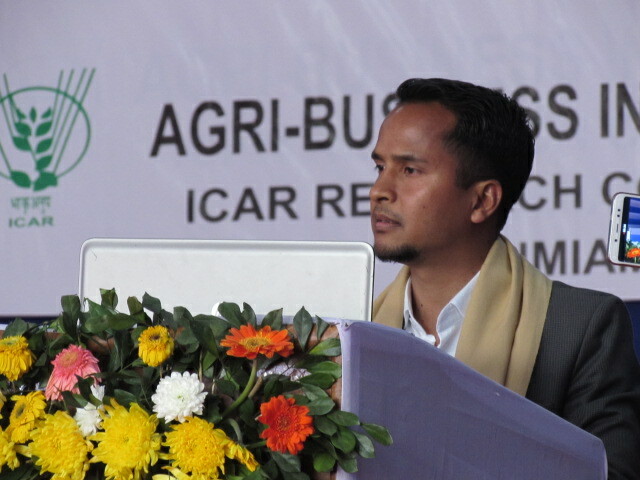 SHILLONG: More than 200 farmers attended the National Agri- business Entrepreneurship conclave that concluded with the Krishi Unnati Mela at the ICAR Research Complex for NEH Region, Umiam, Meghalaya. There were about 500 participants in the conclave that featured more than 80 stalls and 33 Agri-business experts from all over India. Entrepreneurs, innovative farmers, financial institutions, consultants, buyers, sellers, scientists, Agri & Management students, incubators, extension personals, public representatives, policy makers and industrial partners were a part of the conclave. The National Agri- business Entrepreneurship Conclave culminated with valedictory programme on Monday. Apart from the technical session held under five themes, buyer’s sellers meet was an integral part of the Entrepreneurship Conclave. The themes for the technical sessions were scope of agri-business and start-up, agri-business ventures, agri-business ventures under livestock’s etc., technology based start-up and students in agri business. The awards for the best stalls and the best oral presentation in the various technical sessions held throughout the three days were presented to the respective winners. The first prize for the best stall went to Nayam Foods, second prize was given to Green Biotech Eco Solutions Private limited and the third prize went to Arohan Foods Pvt Limited. Addressing the gathering in the valedictory session Dr N Prakash, Director, ICAR Research Complex for NEH Region said that the conclave provided a platform for the entrepreneurs’ and farmers as well to transform production into agri- business. Cabinet minister, Kyrmen Shylla, appreciated the efforts taken by ICAR Research Complex for NEH Region in developing agri-ecosystems in the region. The three-day conclave witnessed brainstorming sessions in which various innovative ideas were discussed and the implementation of which will be followed up. The Krishi Unnati Mela provided a major platform for the farmers to build up relations and upgrade their knowledge about the regulatory authorities, branding and marketing strategies.